Looking for where to download the latest Psiphon handler or Psiphon mods, Tweakware Mod, Netloop (formerly Simple Android Server), Netify, Siphon, Twerkit VPN etc for Android? You are in luck as this article is meant for you. Once any working cheat on MTN, Etisalat, Glo, Airtel, Smile, ntel, Spectranet, Swift, InterC or any network is available, these free VPNs can be configured to gain free internet browsing with them. 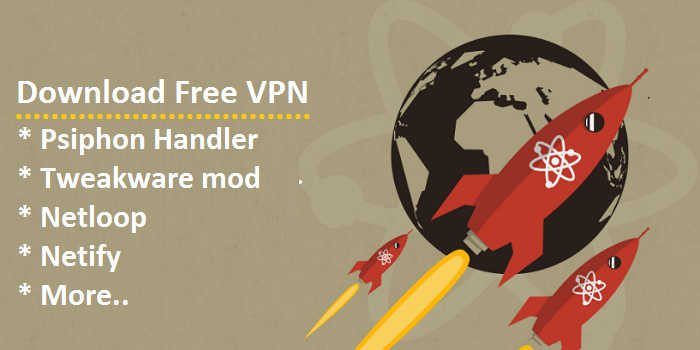 Psiphon Handler and Tweakware mod are the most popular on the list. Millions of people in over 200 countries around the planet are already connecting to the Internet using Psiphon, the most robust circumvention tool on the web. Psiphon facilitates access to websites and services which are censored, blocked, or otherwise unavailable, no matter where you are in the world. Whether you can’t access your favorite news broadcast today, or want to provide an extra layer of protection when using public wi­fi services, Psiphon is the best tool for accessing the open Internet. With the latest Psiphon Handlers, Tweakware Mod or any of free VPN services provided here, you can configure and tweak servers as you desire to gain internet access. Another important thing that you must remember, is that there are very many free VPNs around that you can use. Why this list is important is because they are tweakable. This means you can use Psiphon handler, for example, to access the internet on any ISP whose firewall is weak and you know the right proxy server and/or port to use. • Easy to download and install. No registration, subscription, little or no configuration required. • Psiphon is an open­source project subject to credible security auditing and open review. Below are the download links. Simply download any and use as occasion serves you. This Queencee VPN is a modded version of Psiphon handler with some added features that makes it more stable. Tweakware Mod app is not really different from Psiphon Handler android app. It has all the looks and feel of Latest Tweakware VPN but the operation of Psiphon. TweakwareRed aka Twerk It is another new VPN application. The Modded application has all Tweakware and Psiphon highlight aside from the premium packs which accompanies the Tweakware. UCMini Browser Handler is also similar to Psiphon. Was it for free browsing? If yes… That means the network with which you used Psiphon 3 on has been beefed up hence the frequent disconnection. We will share update on Psiphon as soon as we have a work around.